Ko te Kōtare he manu nō Aotearoa, he manu ruku ika i ngā awa, i ngā roto. He ōrangi mōhinu ngā parirau, te tuara me te kurutou. He hāuratea te poho. Ko te ingoa pūtaiao he Todiramphus sanctus vagans. 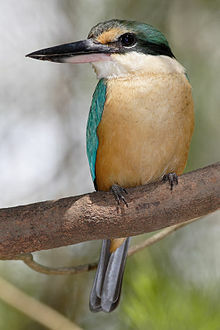 Ko te ingoa reo Pākehā he Sacred Kingfisher. BirdLife International (2004). Todiramphus sanctus. 2006 IUCN Rārangi whero o ngā momo mōrea. IUCN 2006. He mea kite i te 12 Haratua 2006.